JH & HS Slowpitch: Cancelled for March 12th. Congratulations to Camryn Grabeal, Chloe Grabeal and Zarryah Mendez on placing 6th in their latest competition. The team won the Excellence Award, which is the highest award given. This qualifies the team to compete at the World Championship in Louisville, KY.
HS Slowpitch: Monday Dibble Festival is cancelled. Parent Teacher Conferences: will be held on Tuesday, 3/12 and Thursday, 3/14 from 3:30-6:30 each day. NO SCHOOL on Friday, 3/15. Spring break will be March 18th-22nd. Boone-Apache Schools will be closed Tuesday, Feb. 19. Latest from National Weather Service- a mix of freezing rain, sleet & snow will possibly begin before lunch and conditions deteriorating into the afternoon. Our concern is safety of students and staff commuting from school. NO SCHOOL on Monday, Feb. 18th as teachers will be participating in Professional Development. District Basketball Tournament tonight and Sat. night. Games begin each night at 6:30. Apache vs Northeast girls and Apache vs Sayre boys tonight. *Only OSSAA playoff passes can be accepted. Regional Basketball Tournament- The Warrior Event Center will host the 3-day regional tournament, Feb. 21-23. (2) sessions each day, games at 1:30/3:00 & 6:30/8:00. There will be a lot of good basketball to be played here. Upcoming Basketball: *Thursday, Feb. 7th game is cancelled. *Friday, Feb. 8th- final regular season game, HOME, vs. Hinton. Sr. night festivities will begin at 6:00 pm, tip-off at 6:30. *Will host District Tournament- Feb. 15-16, Teams include Apache, Northeast, and Sayre. Both the Lady Warriors and Warriors play in the Consolation Championship of the Caddo County BB Tournament on Sat. Jan. 26 at Anadarko. 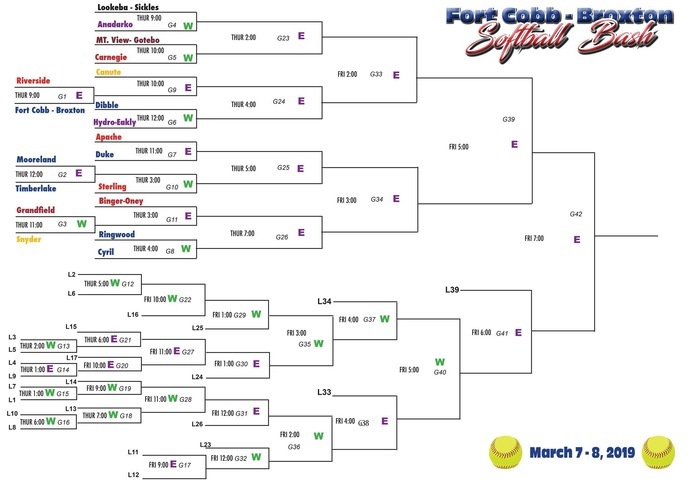 Lady Warriors will play Binger-Oney at 11:30 and Warriors will follow at 12:45 vs. Lookeba-Sickles. Good Luck to both teams tomorrow!! 48-34 Apache with the lead. This will be a busy week for basketball at the Warrior Event Center: *JH- will host Hobart tonight, 1/7, at 6:30 *HS- will host Cyril, tomorrow, 1/8, at 6:30. *Thurs.1/10, Fri. 1/11, & Sat. 1/12- will host the 2nd Annual Slick Hills Invitational. Game times each day begin at 11:00 am. Enjoy a great week of Warrior hoops!!! The High School Basketball games at Hobart will start at 6:00pm tonight. No school tomorrow due to inclement weather. Junior High Basketball Games are cancelled today, December 10 against Carnegie. 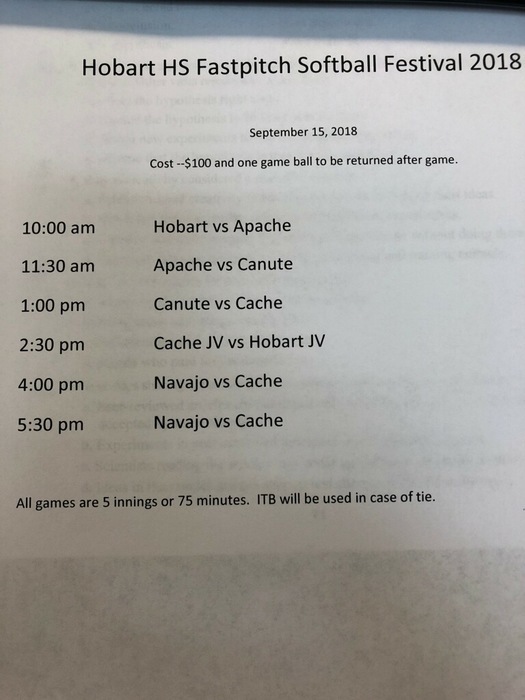 Both Apache and Carnegie High School teams will be finishing play in the Minco High School Tournament today and tonight. Apache High School boys play at 1:30 PM. Good luck Warriors! Lady Warriors trail 29-27 after 3. Lady Warriors trail Watonga 22-19 at half. Art Club- Polar Express scheduled for today is cancelled. Congratulations Junior High Boys Basketball on a Runner Up finish at the Caddo Comanche Tournament this weekend. Good Luck this week! Congratulations Junior High Girls Basketball on bringing home hardware as Consolation Champs at the Comanche Caddo Tournament. Good Luck this week! Congratulations to Avery Scammahorn (Tuba) and Nikolas Craig (Trombone) for making 2nd chair and 5th chair resepectively in the HS Symphonic Band! Congratulations Camryn Grabeal for receiving an Excellence, which is the highest award given in Vex(Robotics) at a tournament in Nowata, OK this weekend! Camryn played 9 matches and went 8-1 placing 1st. There were 7 different schools and 20 teams participated. Good Luck Saturday at the Game Day Cheer Competition Apache Cheerleaders! Congratulations 6th grade girls Apache Basketball Tournament Champions & 6th grade boys Runner up! District Football Championship- Friday night vs. Ringling, here at Chandler Field. Recognition of our Seniors involved in fall activities will begin at 6:45, Kickoff vs. Ringling at 7:30. GO WARRIORS!!! Congratulations Kadree Austin and AnnaRose Blackstar on making the 2A All District 4 fastpitch softball team! Bus leaves at 11:20 for the 5th grade games tomorrow. Girls play at 12:00 and boys play at 1:00. The final MS/JH football game tonight, Tues, 10/23, home vs. Hinton, 5:30/7:00. High School football at Dibble on Friday, 10/26, kickoff is at 7:00. Reminders: 1. Football game is this Thursday at Elmore City with kickoff at 7:00 pm. 2. Fall Break is Friday, 10/19 & Monday, 10/22. 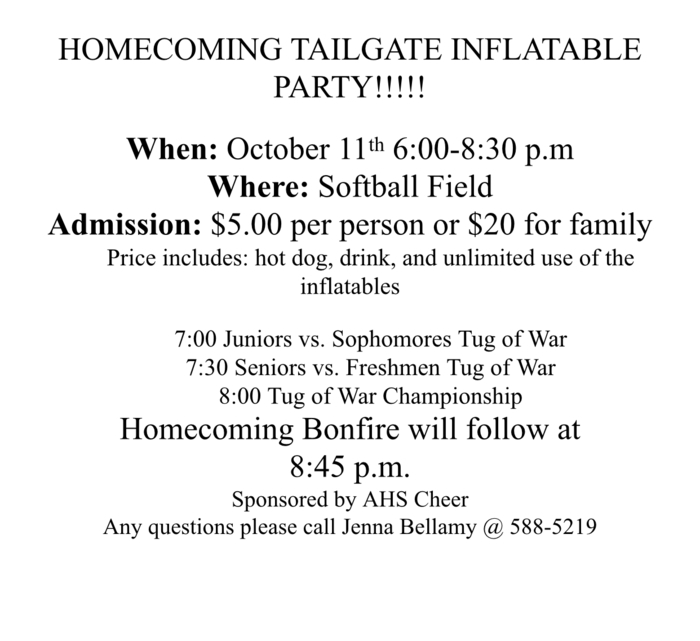 Thursday Homecoming Tailgate/Inflatable Party @ 6:00-8:30!! Parent-Teacher Conferences will be held this week, Tuesday, 10/9 and Thursday, 10/11 from 3:30-6:30 both days. There will be NO school on Friday, 10/12. Lady Warriors win game one of regionals 10-9. Play Pawnee at 6:00. 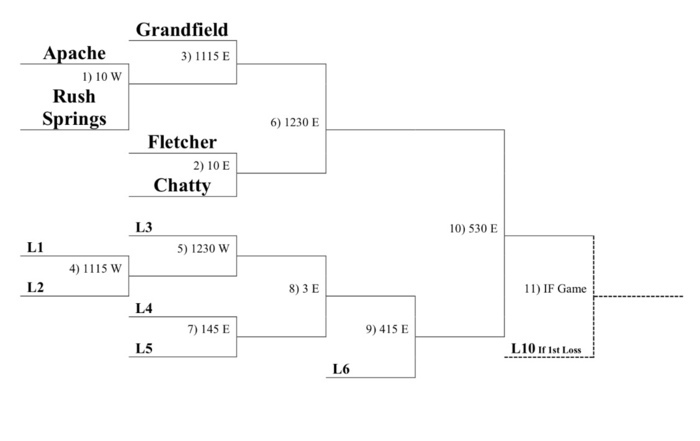 Lady Warriors compete in the Regional Softball Tournament on Thursday and Friday this week. 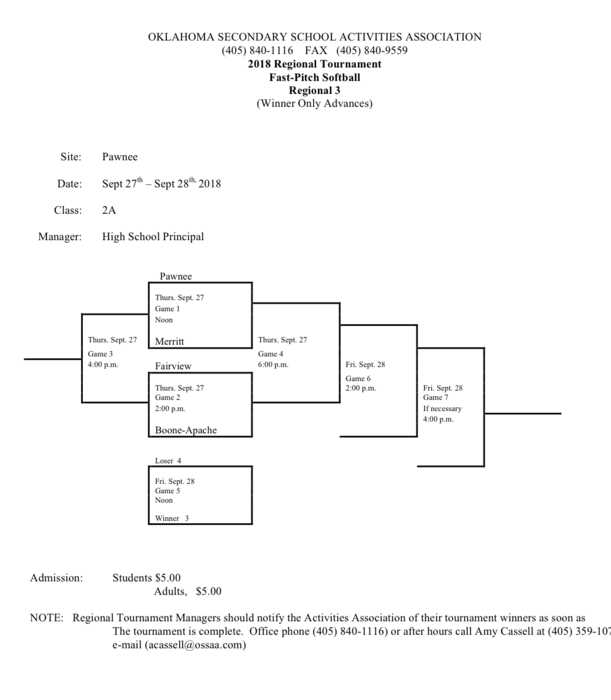 Regionals are being held at Pawnee and our 1st game will be at 2:00 Thursday, Sept. 27 vs. Fairview. Good Luck Lady Warriors! Elementary Fundraiser will be available for pick up on Wednesday, September 26 from 1:30-4:00. Please make arrangements to have your items picked up during these times. Because of possible storms on Friday night, the football game at Healdton has been moved to Thursday, Sept. 20th at 7:30 pm. Kickoff at Mangum on Friday, Sept. 14th is at 7:00 pm. HS SB- Southwest Shootout cancelled. HS SB @ Southwest Shootout... Apache Softball games scheduled at 10:00 are postponed until 1:00. JH/HS Softball games scheduled for Monday (Sept. 10th) have been moved to HS ONLY on Friday (Sept. 14). 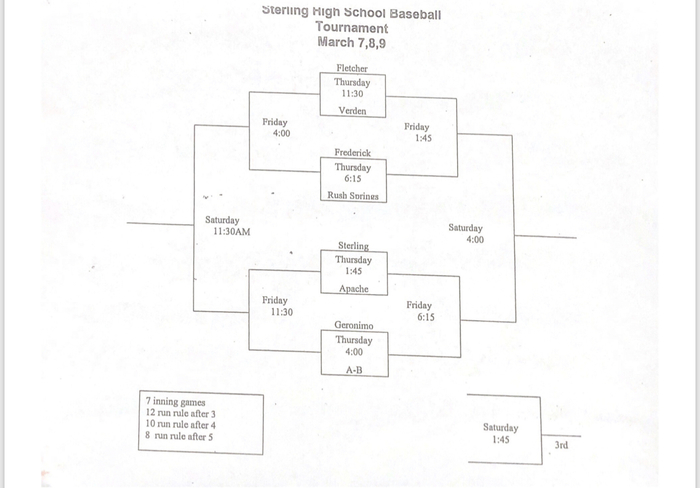 Southwest Shootout softball tournament originally scheduled to be played at Sterling was moved to Marlow Softball Fields. Today's High School softball game scheduled at Walters has been cancelled. The game will be made up on September 20. Congratulations to Seth Grabeal for being honored by News Channel 4 and Air Comfort Solutions (Jason White) as a top teacher in the state of Oklahoma. The airing of the presentation will be today during the 6:00 Channel 4 news. Also, between 4 & 6, Channel 4 will air commercials that will include our students. Apache Elementary Fundraiser packets and money are due Tuesday, August 28th. School wide pictures are on August 29th. Every student will be photographed whether pictures are purchased or not. JH Softball Tournament has been changed to Bray Doyle Aug. 24-25. Due to weather, junior high and high school softball games scheduled for Monday, August 13 vs. Cyril have been cancelled. School is right around the corner. High School Enrollment will be July 30 starting at 6:00 pm, Middle School Enrollment will be July 31 from 5-8 pm, and any new Elementary student may pick-up an enrollment packet anytime between 9-12 each morning. First day of class will be Thursday, August 9th. Continue to enjoy the remainder of your summer break. Welcome to the new Boone Apache Public Schools website!